A three-judge panel of the 6th U.S. Circuit Court of Appeals ruled Tuesday that the federal government can lawfully print “In God We Trust” on U.S. currency. Though the result is a victory for those eager to preserve vestiges of religion in public life, conservative litigators warn the substance of the opinion could redound to the benefit of progressives. The plaintiffs are a coalition of atheists, humanists, and a Jew who claim the motto’s appearance on U.S. currency burdens their deeply-held beliefs, in violation of the Religious Freedom Restoration Act (RFRA) and the First Amendment. The non-believing plaintiffs say the inscription forces them to carry and spread a message with which they disagree, while endorsing a religious position they hold to be false. The Jewish plaintiff says the epigraph compromises his religious practice to the extent that it implicates him in the unnecessary printing and destruction of God’s name, which is sinful under Mosaic law. 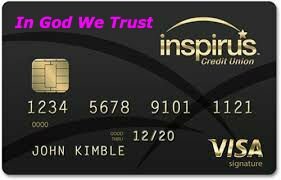 My Visa card doesn't say 'In God we Trust"
I wouldn't have, but I've noticed here in New England a lot of small businesses will give you a "discount" if you use cash (or charge you extra if you use a credit card, which amounts to the same thing). Or in some cases, they won't even allow you to make a purchase with card unless you spend a certain amount. How widespread is this practice, anyone know? I don't recall it in my home state in the Midwest. It’s the same here in Washington. It’s usually something like 50 cents per use. My company charges our customers an extra 2.5% which amounts to tens of thousands of dollars annually for some customers.